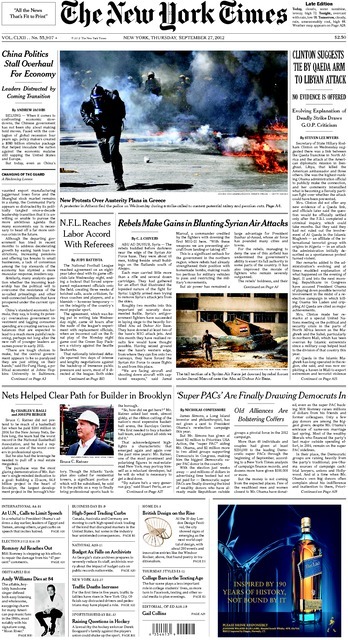 Front-page New York Times profile of Bruce Ratner buries the lead: "promising anything to get a deal, only to renegotiate relentlessly for more favorable terms"
A front-page New York Times profile of Bruce Ratner, headlined Nets Helped Clear Path for Builder in Brooklyn, contains enough criticism (and one new revelation about Ratner tactics) to avoid being a puff piece, but it barely touches on all the reasons for criticism. But what if the article had proceeded from the observation lower down in the article, regarding "his reputation for promising anything to get a deal, only to renegotiate relentlessly for more favorable terms"? That might have led to the Culture of Cheating. Now I don't know the context of Pertz's quote, but Ratner is only generous when he needs to be, for business reasons. His company never hired the Independent Compliance Monitor required under the "historic" Community Benefits Agreement. It tried to get out of paying for trees that were removed. It tried to get more city subsidies for affordable housing and plans to cut costs by using modular construction. It consistently flouted rules regarding construction practices to get the arena done in a tight time frame. And, as the article indicates, Forest City renegotiates whenever possible. This is "he-said, she-said" with a twist. First, the promises of local jobs and affordable housing have, in fact, too often been talking points than actual results. And the "same facts" lead not so much to concerns about a "Manhattan-size behemoth" but concern about what I call the Culture of Cheating. Though groundbreaking on the first of those buildings is scheduled for November, already 18 months behind schedule, neighborhood residents grumble that the area is destined to remain a construction zone in perpetuity. Why shouldn't they grumble? Forest City kept saying it would take a decade. Then the state agency overseeing the project, Empire State Development (ESD), withheld the Development Agreement that gave Forest City 25 years, and the developer and ESD ultimately lost a lawsuit requiring a Supplementary Environmental Impact Statement. That goes unmentioned in this article. The article suggests that Ratner "may be winding down his career," as he has "no other major developments in the pipeline," though I'm not sure that trying to complete Atlantic Yards--and launching a potentially transformative modular business (also unmentioned) is "winding down.". Not so, as noted above. His new mantra, apparently, is "they said we'd never build" the arena. No one ever counted that as a promise. Rather, he promised, "Jobs, Housing, and Hoops." He got rid of the office jobs, plans to cut down the construction jobs, fudged about the arena jobs, etc. Culture of Cheating. The article takes the conventional view of stating that Ratner "has held onto his liberal politics," ignoring the fact that he plays hardball when it counts, contributing, for example, to New York state Senate Republicans. He promised 10,000 office jobs--not merely apartments--and 15,000 construction jobs. As for the "alliance," that's the Community Benefits Agreement--and he financed all of those groups. So maybe the criticism had some merit. Shouldn't this be the frame? Neither Mr. Ratner nor anyone at his company was charged with wrongdoing, and there was no evidence that he knew of the scheme. Fair enough, but unmentioned is that Ratner's deputy Bruce Bender asked Kruger for $9 million in state money to relieve the developer's obligation to pay for reconstruction of the Carlton Avenue Bridge. Actually, in the part of the case involving Ridge Hill, the charge was corrupt payments. Unmentioned is that Ratner's deputy Bruce Bender and his deputy Scott Cantone led the political operative, Zehy Jereis, to believe he'd get a no-show job at Forest City as a reward for flipping the councilwoman's vote, and that both Bender and Cantone left the company around the time of the trial. Chuck Ratner in 2007 candidly said Atlantic Yards would take 15 years, then recovered to claim, not so credibly, that it would take ten years.